I'm anticipating my second winter Christmas but my first one was in San Francisco, USA and it didn't get that cold there. So this is my first REAL winter Christmas. It's almost a week to go and the weather here is regularly below 8°C. A top of 3-4°C forcast for this weekend. I went and bought myself a squishy, warm down-filled coat and some slippers this past week. They are both well used already. For all my life Christmas has had winter attached to it (movies, products, wrapping paper, decorations...) but it's just not like that in Australia. Down in the southern hemisphere it's summer. Christmas is hot (generally speaking) and Christmas meals are often BBQs in the back yard or at the beach. Here all the wintery Christmas things fit which makes it all the more exciting and despite objections from the locals, I hope it snows. A white Christmas would be tremendous. 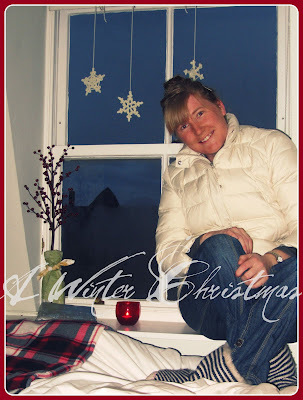 This week I spruced up my bedroom window with the winter Christmas theme. Simple but lovely. My "tree" has two presents under it already. Three if you count the ticket to see Billy Elliot the Musical (technically not under the 'tree' but it is a Christmas present). Most boastfully I crocheted some cute little snowflakes to dangle in the window. ^^ My favourite is the middle one. I basically searched for snowflakes on ravelry just for ideas and then created my own versions. A lovely little festivity in my room and they are most welcome to stay all winter long. I'm looking forward to experiencing a full-blown winter (snow in the city--will surely be an experience). Hope you all have a wonderfully, delicious, fabulous time in great company. We have a present to send, but pregnant brain isn't very good at remembering to send things. It might have to be a nice 'New Years' present instead(assuming I remember to send it soon...).